Japanese Episode AG 003: "Touka Jimu! VS Yarukimono!" 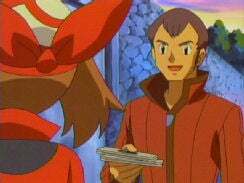 American Episode 275: "There's no Place Like Hoenn"
Satoshi has arrived in Touka City, where he hopes to battle in his first Houen Gym match. However, Haruka doesn't seem too enthused and separates from the young trainer, saying that she has errands to take care of. Satoshi finds the gym and enters only to find a young boy in glasses who won't stop teasing him! The boy, Masato, tells Satoshi that he's the Touka City Gym Leader, but soon Haruka and her family appear to reveal the truth. 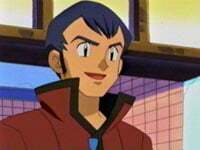 Senri, Haruka's father, is the real Touka City Gym Leader, and he accepts Satoshi's challenge to a battle. 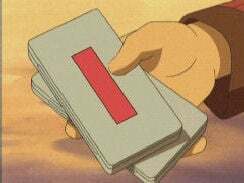 Since the rules are for a three on three battle and Satoshi only has one pokemon with him, Senri tells Satoshi that the match won't count as his Yarukimono makes quick work of Satoshi's Pikachu. 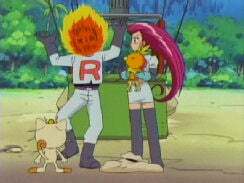 Suddenly, the Rocket-Dan break in and attempt to kidnap both Pikachu and Yarukimono, but all they can get away with is Haruka's Achamo. 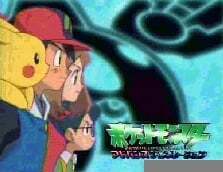 Satoshi-tachi follows them to their balloon, where Satoshi's Pikachu and Senri's Yarukimono quickly defeat Musashi-tachi. Back at the gym, Senri gives Satoshi and Haruka gym badge cases and gives Masato, who has decided to follow Satoshi and Haruka on their journey, a PokeNavi. He then tells Satoshi that the next closest gym is in Kanazumi City, so Satoshi-tachi start their journey to their real first gym battle. With this episode, we meet Masato, Haruka's younger brother and navigator for the group. We also get to meet Haruka's mother and father, making her one of the few characters in the anime to have both a mother and a father. Wow. There's some real grade-A humor here, and it really has captured the early Kanto feel that the show's been lacking for a while now. Unfortunately, there's also a Kanto-amount of editing done in this episode. In fact, this episode contains one of every type of edit I've reported so far, so I guess this episode's special in that respect. As far as the actual voices go, I really have no problem with any of them. I expected Max to sound like Richie / Sammy / every-other-young-boy-character, but he doesn't. It was alright and not nearly as bad as his sister's voice, so that's good. 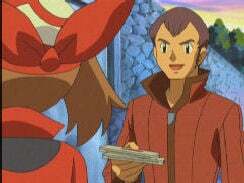 Meanwhile, May still sounds too much like a female Ash. There were seriously times when I would look away from the TV and one of them would be talking, but I'd have no idea who was saying what line. For some reason, this entire episode was zoomed-in on for the Kids' WB! airing. Because of this, the entire outer border of every scene is lost throughout the entire episode. I don't know why this was done, but I do know that it wasn't done in the U.K. In the dub, Max repeatedly calls Ash "Alf" (you know, like the cat-eating alien who had that sitcom in the 1980's). In the Japanese version, he keeps calling Satoshi "Satoru." The eyecatch in the Japanese version changes so that it now includes Masato. 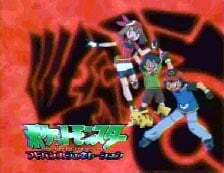 In the dub, they're still doing that "Who's That Pokémon?" thing, showcasing pokemon that aren't from Houen at all. 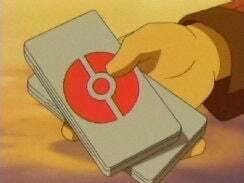 C'mon, if you're gonna keep doing this, at least choose pokemon who are relevant to the episode! The Rocket-Dan think they've stolen either Yarukimono or Pikachu, so they gather around to open the bag. After Kojirou exclaims that it's an Achamo, the little bird pokemon turns to Kojirou and hits him with an Ember attack. This much we saw in the dub. However, what you didn't see was Kojirou running around for two seconds with his head on fire. May: "Oh yeah, that's right. 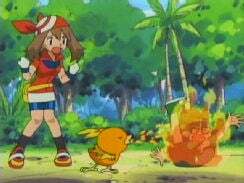 Torchic, Ember!" What was that mushroom doing there? Well, in the Japanese version, the attack "Ember" is known as hinoko. Well, Haruka is trying to command Achamo to use the attack, but she says kinoko ("mushroom") instead. So that mushroom acts as a visual pun. There really was no way to translate that into English, so 4Kids kinda had to rewrite it, replacing "mushroom" with "amber." Apparently, every non-Asian translation of the series retains 4Kids' line. I've heard reports that, for example, the German version of this episode simply translates 4Kids' pun, which makes absolutely no sense since Glut (ember) and gelb (amber) sound nothing alike. I'm actually surprised they didn't just use their digital paint program to paint that mushroom away, but they didn't. This cut is similar to the cut above, only this time it involves Masato being on fire instead of Kojirou. After Kids' WB! 's last commercial break, a second is cut from the pan down of the Touka Gym. No biggie. Ladies and gentlemen, I think I've found the most pointless edit in Pokémon history. Painting away Japanese text? Calling onigiri something American? Changing the background music? No, none of those have anything on this edit. This one tops them all. So what was it? Well, in the Japanese version, the badge cases Senri gives to Haruka and Satoshi have a little Monster Ball design on them. 4Kids painted that design away and replaced it into a red rectangle. And you want to know what's really funny? That edit was only for the Kids' WB! version!! When the episode aired in the U.K., the badge case was left as-is, so one would assume that it's Kids' WB! that ordered the change. I don't understand why it was edited in the first place, especially since May has that exact same symbol on her bandana. Two seconds are cut from the last panning shot of the episode.